own lightsaber. This is the true turning point from Padawan to true Jedi because each lightsaber is unique to that particular Jedi and is an indication of how skilled and powerful that Jedi is. Your lightsaber says more about you than you might ever realize - especially to your opponents. Now with this Force FX Lightsaber kit you can combine the 15 parts into 700 potential combinations to create your own personal and unique 39" (inch) FX lightsaber for the first time ever. If you've always fancied yourself as Jedi lightsaber craftsman then this is the perfect chance for you to put your skills to the test! There's enough variety in these lightsaber components to keep you busy for hours and hours. And when you're bored you can strip it all down again and create an entirely new lightsaber! Now bear in mind that the lightsabers you create with the kit aren't going to be as solid as the pre-made Force FX lightsabers - most of the components are plastic for ease of use. BUT if you're any kind of Star Wars fan of any age then you're going to love playing around with this kit. 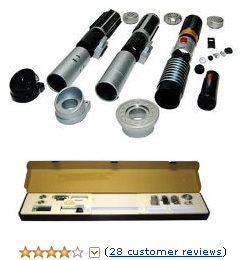 I mean....how often have you seen a lightsaber construction kit for sale?? Make your connection with the Force and your own personal lightsaber right now.